As a fully integrated company, Trassl Polymer Solutions offers coordinated manufacturing processes. As a fully integrated company, Trassl Polymer Solutions offers you coordinated manufacturing processes that guarantee you optimum results in the project flow and product quality. Even special requests and custom-made products can be produced quickly and on schedule due to our flexible processes. The range of possible container volumes extends from 10 ml to 30 litres, depending on the container shape and the clamping dimensions of the machines. All forms are planned using the latest construction software. The use of SolidWorks guarantees an optimal number of interfaces für data exchange with low transmission losses. We are also able to create a visualization for you. We can offer you für a first visual sampling also real 3D-models in the milling procedure or in the 3D-printing procedure. We work out the design of your packaging project in such a way that production is possible. For individual packaging projects, we manufacture special devices and tools in our own workshops. After construction, production of the plastic containers begins in high-precision machines. In the screen printing process, the printing ink is printed with a rubber squeegee through a finely woven fabric onto the packaging to be printed. The final step is the labelling and thus the application of your label to the plastic packaging. We take over the logistics for you and bring your finished goods to the desired location. As a fully integrated company, Trassl Polymer Solutions offers you coordinated production processes. We guarantee optimum results in the course of the project and product quality. Even special requests and custom-made products can be produced quickly and on schedule thanks to our flexible processes. The range of possible container volumes extends from 10 ml to 30 litres, depending on the container shape and the clamping dimensions of the machines. All moulds are planned using the latest construction software. Für we offer you the first visual sampling of real 3D models in the milling process or in the 3D printing process. 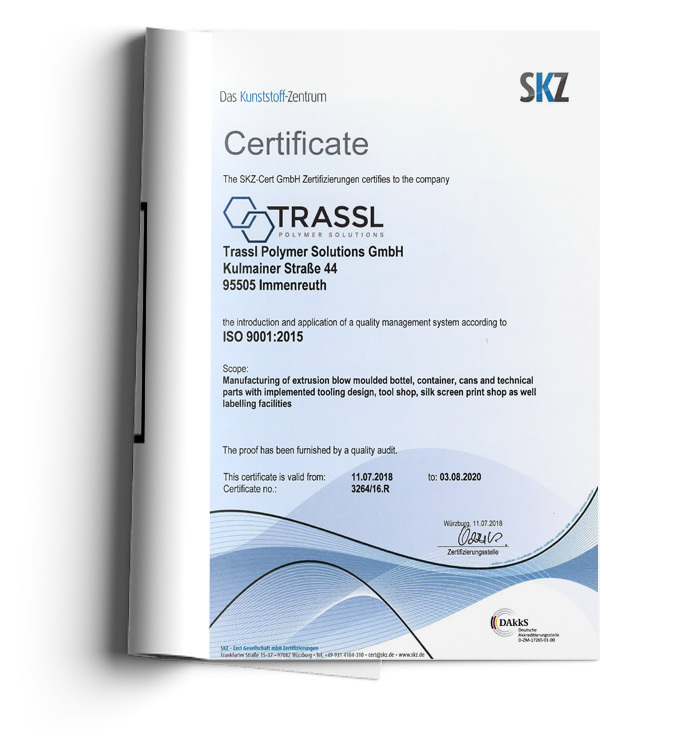 For 20 years Trassl has been a customer of the Inspektionsstelle der SKZ – Testing GmbH for blow-molded plastic containers for the transport of hazardous goods. As a specialist für for the production of blow moulded hollow bodies using modern blow moulding technology, we supply international companies from a wide range of industries. Benefit from our decades of experience for your project. Whether ergonomics, functionality, design, safety, storage, marking or storage, we are your competent and reliable partner when it comes to the production of high-quality containers. We manufacture a large number of bottles, containers and canisters according to customer-specific requirements. We develop tailor-made solutions to meet the requirements of our customers. Whether thin- or thick-walled, whether transparent or opaque in a wide variety of colours, with various closure solutions. In addition, you will find a wide range of different container shapes in our warehouse. Technical parts made of thermoplastics have many advantages. They are light, durable and convince with their high performance properties. In close cooperation with our customers, we develop and produce innovative and sophisticated special components such as air ducts, bellows or small equipment tanks. Due to our high know-how we are able to manufacture even complex tools with forming tools, slides or internal cutting tools to deliver you the best possible product. In addition to standard materials such as PE, PP, PA, PET/G and PVC, we also process a large number of engineering polymers. With these we achieve best results with temperature loads, mechanical loads, abrasion resistance as well as dimensional stability. Entire assemblies can also be manufactured in a part-related assembly process. Show larger certificate? Simply click on our certificate to enlarge it.